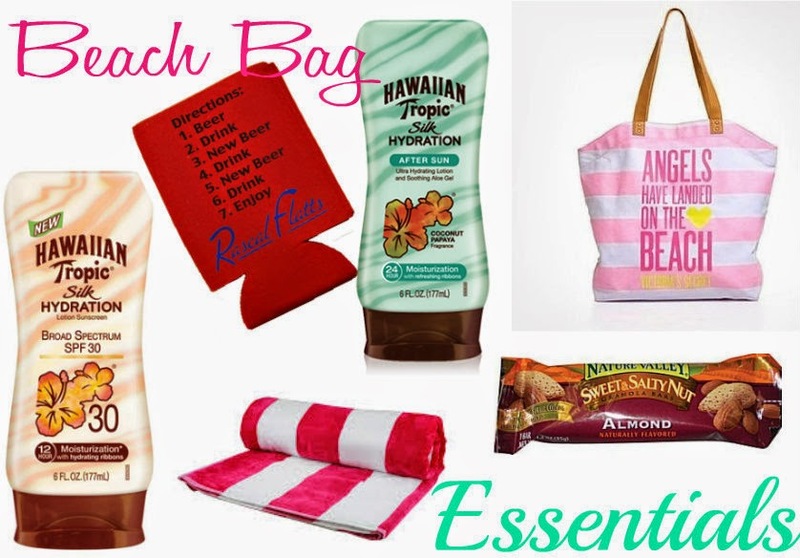 Victoria's Secret Beach Bag - This is my new favorite beach bag. They were sold out on the website so I did some searching and found it on Ebay for pretty cheap! It's pretty long and holds everything I need. Sunblock- This is of course a must for everyone! My favorite this summer is the Hawaiian Tropic Silk Hydration Lotion Sunscreen. It smells amazing & works really well without any oily feel. We usually get SPF 30 & 50, I put 50 all over Bella, then put it on my face, back, and shoulders & 30 every where else. After Sun Lotion - I found this last year and now live off it during the summer. Hawaiian Tropic Silk Hydration After Sun Lotion soothes burned & non burned skin alike. It smells amaze balls & really helps cool your skin down and keeps it from peeling. Towel - Everyone is smart enough to bring a friggin towel right?! Mine is huge and from Target... enough said. Koozie - I actually carry a kookie in my handbag with me (drunkard much?!) but I always bring along some foldable koozies for the ride. Granola Bar - I always make sure and pack a somewhat healthy snack with me. Either a granola bar, pretzels, fruit, etc. just something to munch on while we're out.